A place where the past is honored, the present lived, and the future imagined. 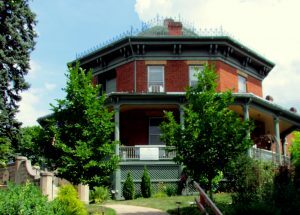 The Octagon House Retreat Bed & Breakfast is nestled in the heart of Red Wing, a lovely historic town situated on the banks of the Mississippi River. It holds a place of honor as one of a limited number of octagon houses still standing in the United States. Today, the Octagon House offers a welcoming environment for people to gather for relaxation, celebration, learning, creativity and spiritual growth. The public gathering spaces within the house, the bedrooms, porch and grounds offer a lovely peaceful setting. Breakfasts are prepared by the owner for overnight guests. Other meals included with workshop or retreat packages or as requested are locally catered. Tablescapes are specially created for each meal, using the owner’s collections of china, glassware and linens. The primary emphasis of the business rests on group needs, special events, multi-day workshops and retreats. Workshops to date have focused on topics such as gardening, a variety of creative arts/crafts and photography and are offered periodically. The house and grounds are a lovely and unique setting for small celebrations, reunions, girl-friend outings, group gatherings, special luncheons and meetings. It is also a perfect venue for individual and small group retreats. The owner is happy to work with you to customize your gathering or event to meet your needs. The B&B is also available on a more limited basis for travelers.